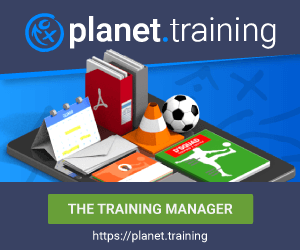 The following describes a training session with an emphasis on speed, however including technical and (latter stages) some tactical aspects of the game. Please refer to our figure. However, depending on the pitch size available it would be possible to use both goals. In order to have a clear understanding of the drawing we have used both goals. If you setup up two lines of players (~8 for each line) the session will run smoothly. A square with 4 cones (7.5 x 7.5 meters) that “sits” on top of the penalty box (and therefore ~16-22 meters away from the goal). An additional square (again 4 cones 5 x 5 meters) builts the extension from the first square and another cone 5 meters even further away is needed. Generally and with regards to a micro-cycle, this session should be placed close to game-day, as the recovery from sprinting is quick (within minutes) and the total load of the session will not be high. Usually, we do not like to send mixed-messages...however, we have stated earlier that sprint training should be peformed in a non-fatigue state. It is seems unrealistic that fatigue does not occur in a football match in which players are still required to perform sprinting, passing etc. Therefore we believe that those exercises can also be part of latter stages during training. We have implemented those sessions in male youth (U15 – U19), professional adult female and amateur adult male soccer players. a) three players are needed for this exercise. 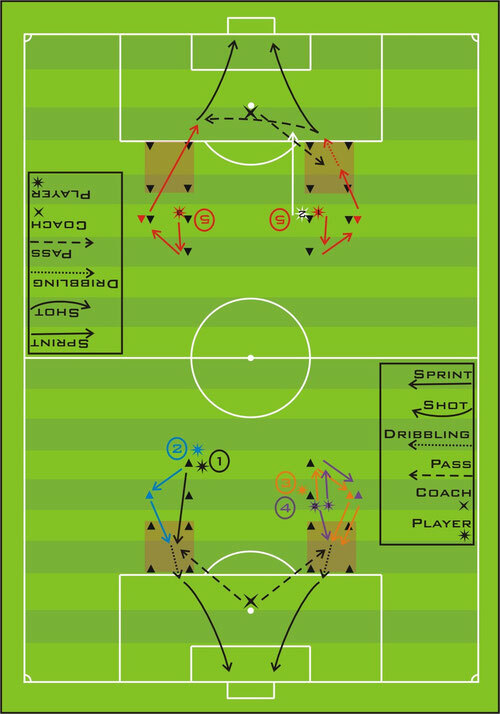 The first and the second player repeat (nearly) exercise #3, however, the second player (white arrow) starts sprinting/accelerating towards the goal and act as a defender (possible variation is to let him go backwards), while player 1 and 3 act as offenders. Player 3 starts right after player 1 started, and supports him (player 1) in a 2 vs. 1 situation in order to score.